Canada Day Food ideas do not have to be complicated nor expensive. 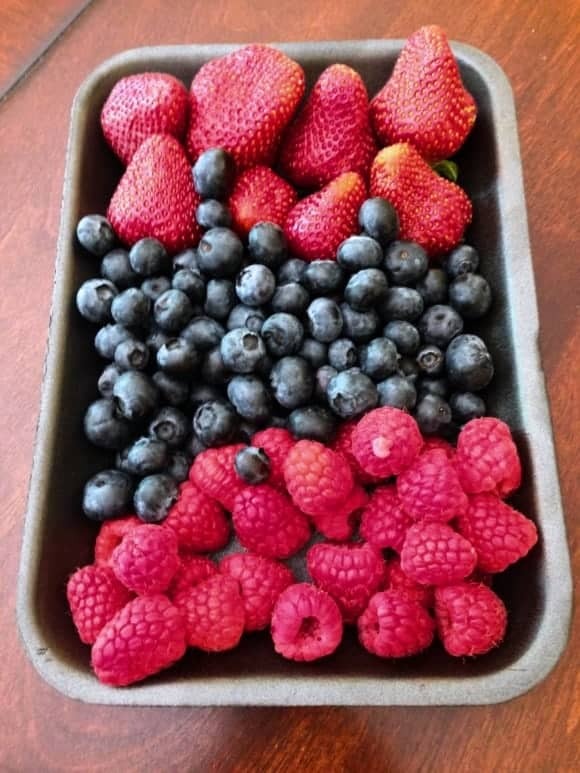 Use some imagination- berries to have the colors- and some basic ingredients you have in your pantry. The following Canada Day food recipe took less than 30 minutes and costs less than $6. Yet it has a beautiful presentation and most important thing: it tastes good. It is also a guilt free recipe as it is low in sugar and fat. Let’s see how you can impress your friend with this Canada Day Food recipe. Canada Day Food: Maple Leaf Shaped crepes. While I browsing Pinterest for Canada Day Food ideas, I found that most of the recipes had a lot of sugar and required quite some time in the kitchen. Since the kids are on vacation, the cooking time is scarce. I had to find a healthy and quick recipe. So I came up with this idea: how about a maple leaf shaped crepe? Homemade crepes. I usually this basic batter crepe recipe or this whole grain crepe recipe. (cost around $3). Raspberry and Strawberry for decoration. I bought this beautiful basket from the farmer’s market for $5. I did not use it all for this Canada Day recipe though. Prepare your crepes: I usually have crepes in my fridge. Kids love them for breakfast. If you are making the crepes, make sure to let them cool off before using the cookie cutter to make the maple leafs. Display the crepes on a nice plate. 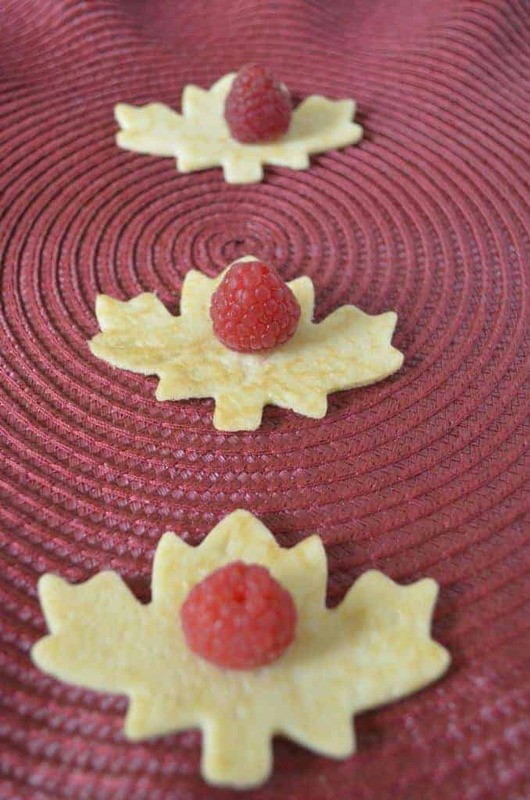 Top with raspberries and use the Canadian flag a a toothpick. For extra sweetness, you can top with some maple syrup. I did not do it as I don’t want my friends to have sticky hands! 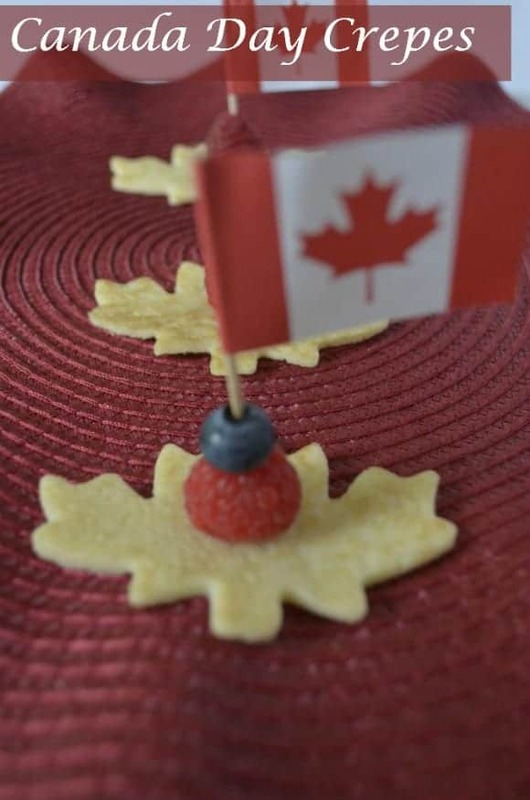 Kids can help you with this Canada Day food recipe. My daughter had fun making the maple leaf shaped crepes and all other kind of shapes. For other Canada Day Food Ideas, check our Pinterest board. 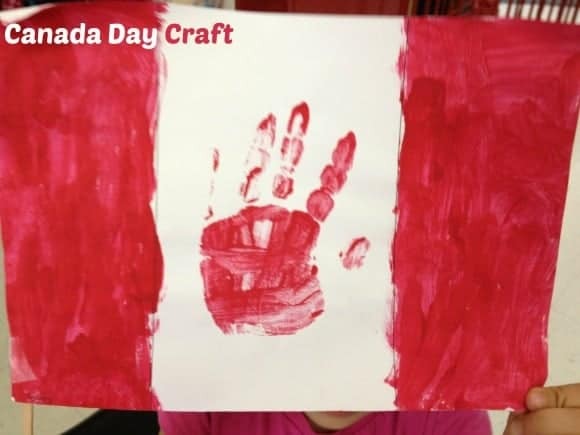 If you want to impress your friends more, let your kids make this easy Canada Day craft for kids. Details at our sister site, MyKidsGuide. What do you think? Isn’t it an easy recipe for this upcoming Canada Day? That was just way too cool – never even thought it was crepe at first lol.. Okay those are adorable! We love crepes but the thought to make them into something a little cuter never crossed my mind! I see patriotic crepes in my future this weekend! These maple shaped crepes look amazing and I think it is an awesome idea. I love the raspberries in the center. I will have to try these for sure. The fag made by the kids is an awesome idea too. I love this one made. Thanks for sharing. We have so many fresh strawberries right now that this gives me an idea on how to use them. Crepes are SO good! What a creative idea – Being Canadian we will be doing many Canada inspired things and I think these crepes just have to be added to my list. Love the Flag and I will use your idea to make with my nephew he will just love it. Thanks for sharing! gosh do i love crepes!!! These themed crepes looks perfect for Canada Day. It looks really delicious too. I’m sure a lot of people would love to have them. These look wonderful! One of our favorite places for brunch is in Niagara, Ontario at a crepe place. Not too much beats a delicious crepe and a hot cup of coffee. Those are so cute. I love the little flags you added. It’s been such a long time since I’ve made crepes. Your crepes look so delicious! I love the flag, these are all great ways to celebrate Canada Day! This is a wonderful idea and they sound tasty as well. You are correct about all the sugar–none of us really needs it and I am a diabetic! However–a bit of real Maple syrup would hit the spot! Nothing says celebration like crepes do! They are fun and appeal to children of all ages! Happy Canada Day! Great recipe! I also make different shaped cookies. My grandchildren really like the Happy Birthday Cookies,(with a candle for the birthday person on top. I use the family recipe “secret recipe” to make them! That’s such a cute food idea! These are so cute! I will definitely be making them for Canada Day! Such a great idea. My boys would love these! What’s the deal with kids jamming stuff up their noses?